The GSS Graduate Support Program is just one of the many aspects of our unique model that makes GSS special and sets us apart from other shcools. The program provides the principal source of transitional tools, placement guidance, academic, social and peer support for the Good Shepherd’s graduating students – who first came to the school as young, at-risk children. The Graduate Support Program allows our graduating students the resources to sustain the exceptional education received in Good Shepherd’s elementary level classes, and maintain and grow their academic successes as they matriculate to secondary school and beyond. How It Works: The Good Shepherd Graduate Support Program eases a middle-school graduate’s transition into high school, maintains a connection with all graduates during high school, advocates for students, assists in preparing students for high school graduation and post-secondary education, and tracks the growth and achievements of all graduates. Direction of the Graduate Support Program: Mr. Thomas Moran, Jr., President of the Good Shepherd School, supervises the Graduate Support Program which is under the direction of Mr. Sean Alphonso. Mr. Alphonso graduated from Jesuit High School in 2007 – where he was active in the ROTC and Rugby – and from Saint Louis University in 2011 with a Bachelor of Science in Social Work degree. Mr. Alphonso worked for homeless service and mental health providers in St. Louis for three years after graduation and returned to New Orleans in 2013. He has been a key member of the staff at Good Shepherd School since that time, and is in his third year as the Director of Graduate Support service. 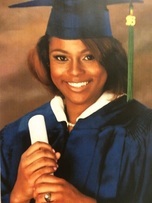 Angel - GSS Gradudate, Class of 2011 currently attending Xavier University on full scholarship studying pre-med.